SIOUX CITY, Iowa (CNS) — Briar Cliff University President Bev Wharton agrees with economist Milton Friedman’s 1975 book, “There’s No Such Thing as a Free Lunch,” when it comes to President Barack Obama’s proposal of free community college. “I do not believe that offering free college to everyone, regardless of financial position, is in the best interest of higher education or our country,” she said. Obama’s plan, revealed in a series of speeches in January — including the State of the Union address — would offer two years of free community, or technical college, to students who go at least half-time, maintain a 2.6 grade point average and make progress toward a degree. The idea is to make higher education accessible to all — at an estimated cost of $60 billion over a decade. Wharton said she supports making higher education affordable and accessible for those who want to pursue degrees. In addition to Catholic-run Briar Cliff, Sioux City also is the site for Western Iowa Tech Community College and Morningside College, a private, four-year college affiliated with the United Methodist Church. However, Wharton questioned the proposal’s outcomes. In fact, Wharton speculated the plan might cause an “adverse effect” on enrollment for traditional institutions, such as Briar Cliff — a four-year university operated under the auspices of the Sisters of St. Francis of Dubuque. “Federal and state officials need to understand the ripple effect that legislation could cause,” she told The Catholic Globe, newspaper of the Sioux City Diocese. According to the Iowa Association of Independent Colleges and Universities, Iowa’s independent, nonprofit colleges account for more than 10,000 jobs and $1.8 billion in annual economic impact. “Those figures are not even taking into account the employment and economic impact of state schools, which are also traditionally known as four-year institutions,” Wharton said. Obama has stated “free” community college would made higher education as accessible as a high school diploma. However, Wharton countered that most institutions already provide substantial assistance to students. For example, Briar Cliff supports the federal Pell Grant along with the Iowa Tuition Grant, and “100 percent of our full-time, undergraduate students receive some form of financial aid,” she said. 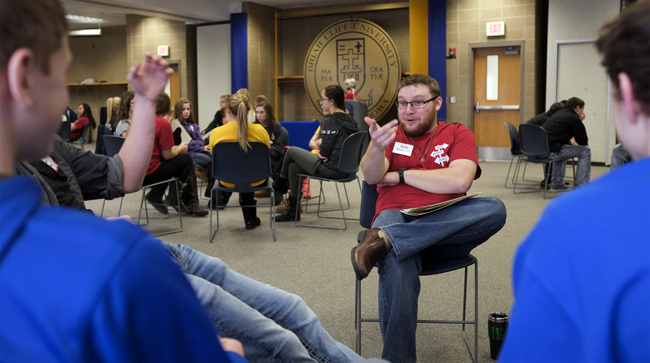 With a mix of scholarships, grants and loans, Briar Cliff creates financial aid packages that cover more than 85 percent of tuition and fees for the average student. However, institutions of higher learning still have costs, and Wharton said the two-year community college free ride might force four-year colleges and universities into lowering tuition, reducing faculty and/or staff and re-evaluating majors. “It’s really too soon to speculate on exact implications,” she said, but added that impacts on enrollment has to be considered. “Briar Cliff will employ strategies to remain agile; however, it (the proposal) could potentially change the landscape of how education is delivered. Wharton cited Pope Francis who has said the work of the church is to serve the poor and Briar Cliff does that in two ways. Even if Obama’s free community college is implemented, according to Wharton, Briar Cliff would continue helping students see value in an education at a Catholic institution of higher learning. To graduate, Briar Cliff students must fulfill a religious general education requirement. Associate theology professor Linda Harrington has taught the full range of religion classes since joining the faculty in 2000. She has seen the full spectrum of students — from those engaged in their faith to those who are hostile to religion. The idea of earning a degree with no debt associated with it sounds attractive, but getting an affordable, faith-based education at Briarcliff is far more important to student Jacob Rosenmeyer, 22, who is majoring theology, history and secondary education. He will receive his diploma in May. Wharton said Briar Cliff University — as a Catholic, Franciscan university — provides an experience that forms students in an environment that cannot be replicated at a community college. I think the real reason for having free community colleges is an attempt by Obama to force small Catholic and Protestant colleges to close. Obama has already stated that he doesn’t believe in religious private schools and believes everyone should be taught in government operated schools (or at least secular schools which are in league with his propaganda).